Comfort is a curious thing. It can make you lazy, it can leave you stuck in a rut. It can even make you want to begin questioning something that you once previously loved and were passionate about. It may be too much to say that we are getting comfortable in our Latin eating adventures, but we do have moments where we start to think that we know what we are doing…a dangerous place to be for sure. A trip into the suburbs to visit a total unknown eatery should do the trick and set us straight. It begins with the word Taqueria. For some reason we have found that any Latin eatery with this word in the title usually means the following things: small, unique, regional, very Mexican and very good. Now, the mere mention of the word can make me hungry. 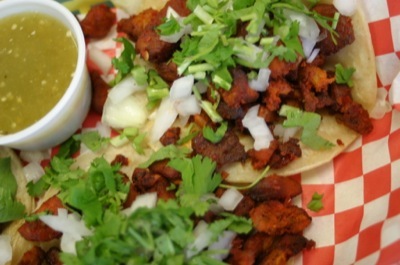 Taqueria Hidalgo, in Burnsville is no different. Situated in an out-of-the-way strip mall, it would be almost impossible to just stumble upon. We were glad to have directions and noses that seem like GPS to chiles and cilantro. Once inside, I could hardly wait to order as the smells were inviting, but wait I did, as Charles was stuck in traffic. It was this waiting that led us to the synchronous moment when we discovered picalitas. To explain, I had been milling around, watching Spanish soap operas and contemplating my order when a Latino couple walked up to the bar and began chatting with the woman cooking behind it. She gave them a knowing smile and went into the back kitchen to retrieve something. That something was an enormous flat pan that went onto a special burner that matched the pan in size. Upon seeing that, I only had one option. I simply had to sidle up to them and figure out what in the hell was going on and why I didn't know about it. PicalitasWell, what was going on was the preparation of a regional dish from near Mexico City. The couple specifically referred to the Mexican states of Morelos and Guerrero. What were they? Well, I can only tell what I was tasting and hope it is accurate. 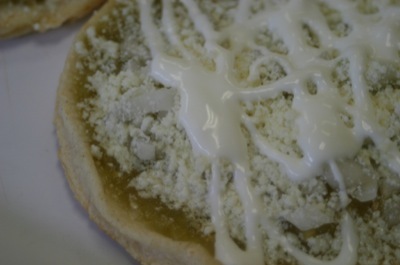 The little delicacies called picaditas are founded on a white corn cake which is grilled dry. They are topped with salsa (verde o roja) and then given a generous covering of sour cream, dry cheese and onions...that's it. They were simple and fantastic and another example of how much we have to learn about all of the possible regional dishes of Mexico and the slight variations on the theme of corn, salsa and cheese. More than that, it reminds me of what we are missing because we are still outsiders to a degree and darn it, after all this time our Spanish is still terrible. So, we were charmed, our timing was perfect and we have yet another story to tell. But alas, now we must get onto the business of eating and talking about eating. As per our agreement laid out in our intro article about these Latin eating adventures, we had to order tacos and tamales. They had no tamales, but thanks to the picaditas, we were not about to mope around. We also had to ask for a recommendation, which came from the couple who keyed us in to the picaditas. 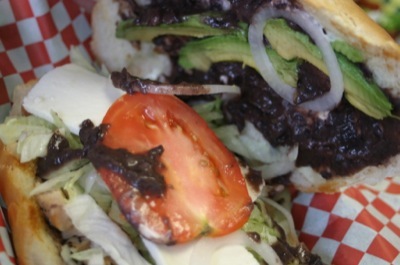 They said we simply had to have a torta. Done. We finished the order with a delicious looking caldo de res. The tacos were just fantastic. The al pastor was not the vertical skewer type, but house seasoned, cubed pork that was just loaded with sauce. 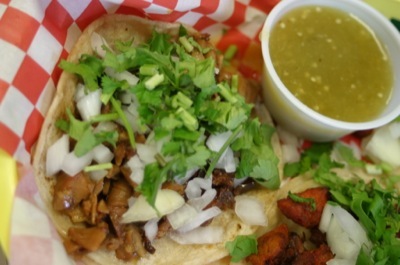 For al pastor, it was not very greasy and the flavor was truly unique; elements of coriander, cumin and something akin to vanilla made it seem almost mole-like in its complexity. The other taco was buche (pork stomach). It was fried to have a slight char and was quite greasy, which I liked. The greasy and rich flavor makes for a very satisfying taco when you combine it with the cilantro, onion and lime. Next, we come to the recommended torta. Surprisingly, we had the option of black beans, which we chose. The meat we opted for was grilled chicken, an excellent choice. The torta in total was indeed outstanding and with tortas, I can never quite discern what makes some better than others. This one seemed to win me over just by the quality of each individual ingredient (even the tomato was nice and ripe). Plus, this one was a bit more wet than others which worked in its favor to me. Overall, it was very good and I would order it again. The torta, taken apart to reveal its secrets...notice the black beans...Finally, we come to the caldo de res or beef soup (pictured at top). For some reason we were craving soup and after we were informed that they did not have pozole that day, we were forced to decide on impulse. 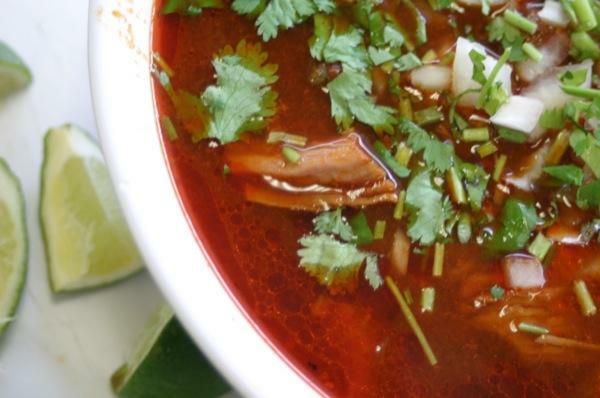 The bright red broth of the beef soup won us over. By our first taste, we were pleased with our decision. The broth was very warming, but not overly spicy. It was earthy and rich, surely thanks to the beef stock and a healthy measure of peppers (were they guajillo, pasilla, mulato?). The lime and cilantro again provided the necessary balance. As for vegetables, it was rather rustic and simple with nothing more than some large pieces of carrot and potato. These were fine and good, but it is the broth that keeps you coming back for more. Yum! I'm sure it is pretty obvious that we were impressed with Taqueria Hidalgo. It is just another example of a simple, humble place that really knows how to handle food. I would be confident trying anything at this establishment, but if I had to name a few must have items for my next visit…hmmm….Surely I would get a couple picaditas, just because I could feel like I was in the know and they were a tasty snack. I would also get a torta, especially if I was just passing through. I do want to try the pozole and of course, the tacos were without fail. However, the one thing that really stuck with me from the visit was what I saw at least three people eating while we were there. A dish that was simply called pescado frito (fried fish) looked outstanding. It was a whole fish, fried and served with beans and rice. The fish was huge and everyone eating it looked really pleased with themselves. Enjoy! Of course the picaditas were a surprise. Also the simple fact that this place is in Burnsville and has a full service market in the strip mall as well. Language: Somewhat challenging to communicate, but they all seemed to speak English fairly well. Menu was simple and easy. Lawrence Black is a writer and editor at Simple, Good and Tasty. He can be reached at lawrence@simplegoodandtasty.com. Despite the heat of summer, he continues to eat large quantities of spicy things...and without beer (a true daredevil). 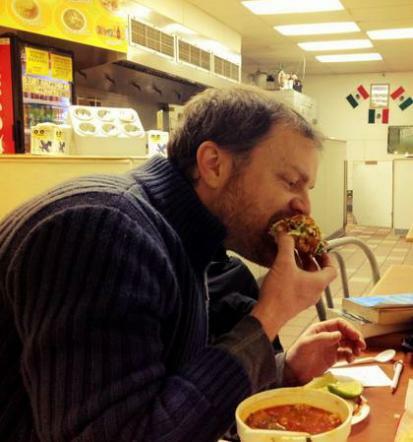 Our last Latin Tongue review was: La Hacienda (St. Paul).